Even as the holidays wind down, so-called “hoverboards” continue to be a hot ticket at retailers and shopping malls around the country. One such busy mall happened to be in Texas where a self-balancing scooter caught fire, marking it just one of dozens of fires reported to federal safety officials in recent months. 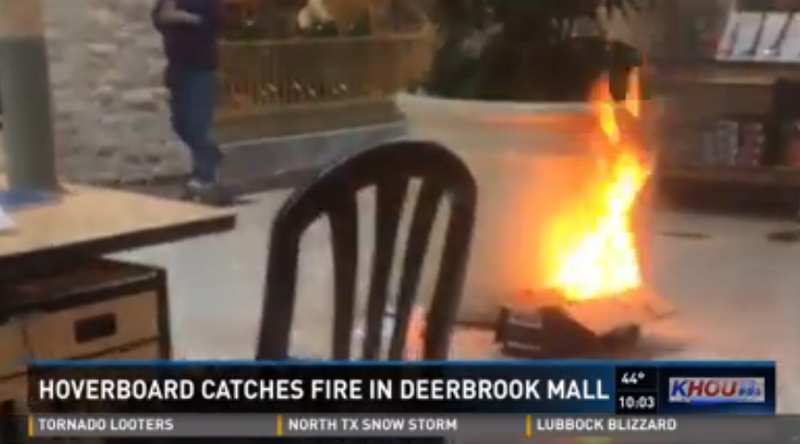 KHOU reports [warning: link has video that autoplays] that smoke filled part of the Deerbrook Mall on Monday after a hoverboard caught fire at the kiosk selling the devices. Local police say that staff at the mall used a fire extinguisher to put out the small blaze before firefighters arrived. The mall was evacuated briefly, but no injuries were reported. Unlike other hoverboard explosions that occurred while the device was plugged in to charge, KHOU reports that the scooter at Deerbrook Mall was still sitting in the box. “It just sounded like a small explosion sounded like a bomb honestly,” a woman shopping with a friend at the mall said. The incident in Texas is just the latest in a string of issues for the popular self-balancing scooters. On Monday, the Consumer Product Safety Commission announced it had received at least 22 reports of fires in 17 states, as well as 70 ER-treated injuries. The agency expects to receive more reports via safer products.gov in coming days and weeks. CPSC chairman Elliot Kaye issued a statement on hoverboards shortly before the holidays, saying that investigators with the agency were working “non-stop” to find the root cause for the fire hazards linked to the devices. So far, they believe lithium batteries could be the source of issues. Safety concerns related to the gadgets began popping up last month when a Louisiana family says the not-actually-a-hoverboard caused a fire that burned down their home. A similar incident was reported in New Jersey on Monday. Shortly after that episode, retailers, including Amazon and Target, began pulling the self-balancing scooters until manufacturers could provide proof of safety standard requirements.